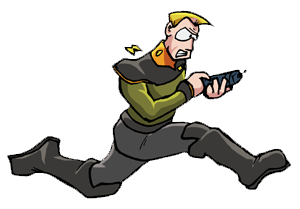 Until very recently Captain Kaff Tagon was the current commanding officer of the mercenary company "Tagon's Toughs". He recently turned 49 years old. He is 1.9m tall (around 6' 3"), and masses 95 kilograms (around 210 lb) 2003-05-11. He is fond of "cheating" and has at least two concealed weapons on him: one of his epaulets is a grenade, and his boots contain a Dorothy wire 2001-03-17. Some of the armor Tailor has made for Tagon is capable of concealing eight to ten "additional" weapons 2008-10-25, but whether Tagon has chosen to leverage his enhanced concealed-carry capabilities is as yet unknown. Captain Kaff Tagon was 42 years old when he founded his mercenary company. Like most small businessmen, he named it after himself. Tagon's Toughs started small, with a roster of only 25, most of whom fell into the category of "multi-purpose grunts," including some close friends Tagon had worked with during the previous two dozen or so years. During the Terraforming Wars, Kaff was a member of the Oatmeal Peacekeepers, "... an elite unit, skilled in the arts of war, disciplined in the keeping of peace, and fully able to feed you your heart with a spoon should you unwisely persist in making fun of the one on their arms" 2003-08-09. He then saw action as a midshipman on a light frigate, before leaving to start his own outfit as a "Merchanter-at-Arms" via the Celeschul Reserve's shipsteading program. After 10 years duty he upgraded his ship to a mercenary vessel and actively began operations as the "Toughs" 2003-02-22. Three years after its founding, Tagon's Toughs recruited its first carbosilicate amorph, and was very shortly thereafter acquired by some entrepreneurs who thought a mercenary company would make a great marketing tool. Depending on how you look at it, that deal worked out okay. Tagon owns the majority of his company again, and it has more than tripled in size. They're still small, but they make up for it by being violent. Tagon has been mistaken for an idiot, a misogynist, a pirate, and a politician. He had to be PAID to impersonate the politician. He's not as dumb as he looks, but he's not quite intelligent enough to get away with not also being very, very lucky. A version of Tagon was killed on 2004-10-31. Kevyn Andreyasn later went back in time and averted this, in the process of saving the galaxy from the Pa'anuri-sabotaged core generator. He has had the dubious privilege of being close enough to hear an annie-plant let go on at least four occasions, and can identify such an event by the distinctive "SKOOM" noise [2005-06-18, 2010-11-04]. Captain Kaff Tagon was killed in Action while repelling boarders 2016-09-18 by detonating a ship-to-ship missiles warhead inside the Broken Wind's Fabber-Bay taking out 40 armoured Esspee as well as the teraport cages those units used to board and bring reinforcements. Son of General Karl Tagon (retired) 2004-11-26 and Mirali 2012-10-14, (deceased 2012-10-21). Grandson of Karla Klingbo (deceased) 2011-11-04. Had two younger siblings (name unknown), both deceased 2012-09-30. Former member of the elite Oatmeal Peacekeepers 2003-02-22. On friendly terms with Petey. First appearance 2000-06-16. Given name first used on 2001-01-24. This page was last edited on 25 July 2017, at 04:18.